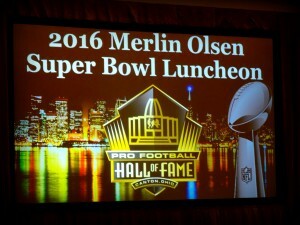 Warrior Wishes Come True at The 2016 Merlin Olsen Hall of Fame Luncheon! 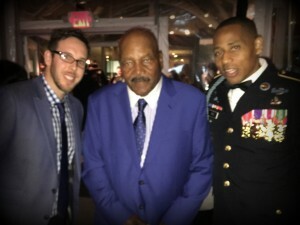 After a fun night in San Francisco hosting heroes at the MaddenBowl & celebrating Jim Brown’s 80th birthday with Cedric, it was time to recognize these Warriors for their service & sacrifices. 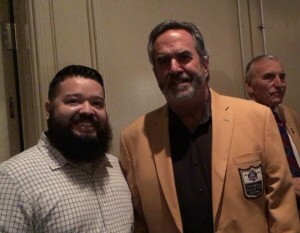 Every year the NFL Hall of Fame puts on the Merlin Olsen Hall of Fame Luncheon during Superbowl week. Hundreds of NFL hall of famers & Players gather to celebrate the Gold Jacket & share what it means to be in the Pro Football Hall of Fame over lunch. It’s one of the most desired events to be at during Superbowl week! The Event was held at the Hilton in downtown San Francisco. 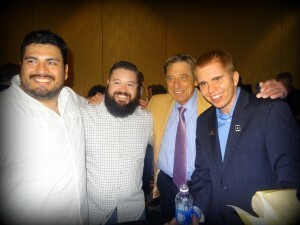 Autograph hounds swarmed the hotel lobby hoping for the chance to meet some of the NFL’s best. 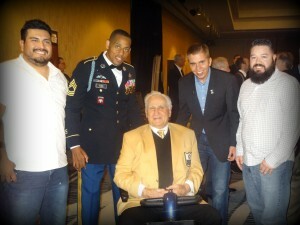 We were lucky enough to be attending the event and got a front row seat to watch all the Gold Jackets walk in. 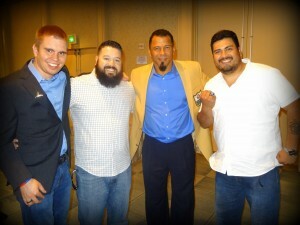 Many of them stopped to meet the warriors before the event kicked off. 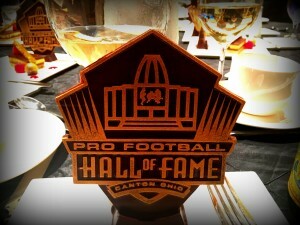 Once it was time to go in, we couldn’t help but notice the Hall of Fame logo made from chocolate on everyone plate. It was so cool that nobody wanted to eat it, it was awesome! 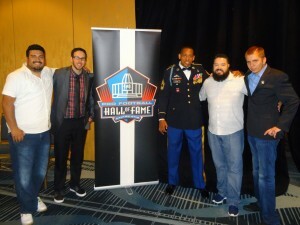 We have been very thankful to have teamed up with the Hall of Fame over the past few years to host Warriors at the event, but this year they went way above & beyond by recognizing Wes, Bryan, Julio & Cedric during the event! I had tears in my eyes watching the Warriors receive a standing ovation from everyone at the event. It was a moment that we will never forget. 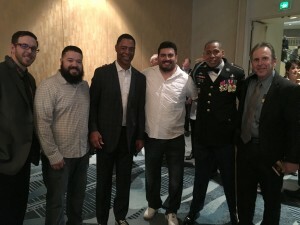 Speaking of unforgettable moments… Cedric, Bryan, Wes & Julio had the time of their lives getting to hang out with some of the games biggest legends! 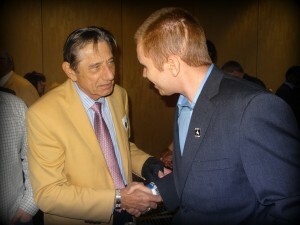 Joe Namath, Marcus Allen, Don Shula, Jerome Bettis, Kurt Warner, Jerry Jones, and many more! It was an experience of a lifetime! 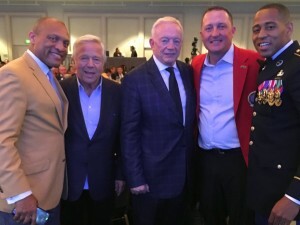 We would like to thank the Pro Football Hall of Fame for helping us recognize these Warriors for their service & sacrifices & for helping us make their warrior wishes come true! 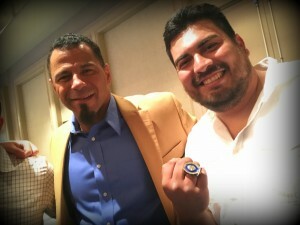 After the event we hung out to meet a few more Hall of Famers including Rod Woodson & James Lofton. 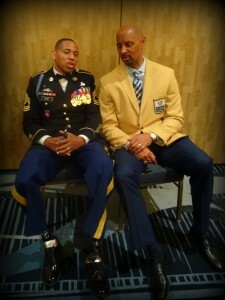 Woodson Let the guys try on his Hall of Fame Ring! Then we said our goodbyes to Bryan, Wes & Julio. Then helped Cedric get an uber out to Santa Clara to pick up his wife from the airport. Once Cedric was on his way to pick up his wife, my dad & I met up with Lou for a few hours at a party to honor Brett Favre & Tiki Barber. After snapping a pic with Brett we then made our way across town to Fort Mason where we made warrior wishes come true at the ESPN party! 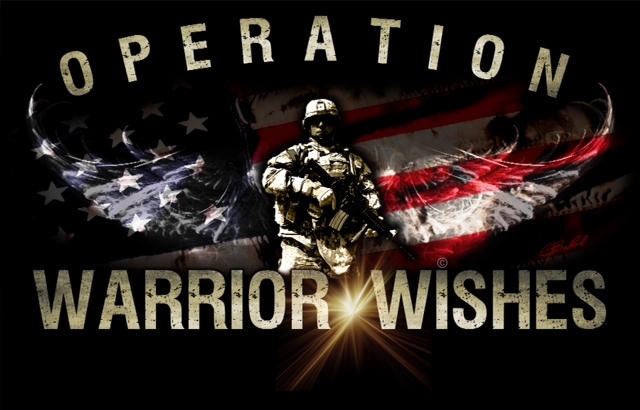 It was one of the craziest memory filled 2 days of making warrior wishes come true ever! On July 25th 2012 Cedric was serving in Afghanistan. At the time he was a platoon Sargent & As usual, he received the coordinates of where to go, just like every day, setting out 10-15 minutes later and getting fired upon, which was nothing new. The only thing different on that particular day was that this was a new sector. Cedric’s team happened to be covering for another platoon. They were bringing a group of guys to cover when Cedric’s right foot stepped on an IED. He didn’t know what had happened. In fact, he thought at first that he had just been blown back by the blast. The men around him were hurt too, but Cedric received the majority of the injuries, although at the time, he didn’t realize it. He said, “I was really upset that I didn’t get a chance to finish getting the guys who were shooting at us,” but he said that wore off soon and started gasping for air. He looked at his body and quickly realized that it was mangled. Soon, the helicopter arrived to take Cedric and the other injured men to the closest base, Kandahar. Cedric said that once at the army base, he had no recollection of anything until he woke up a week later on August 1 at Walter Reed. If that doesn’t inspire you, this will. 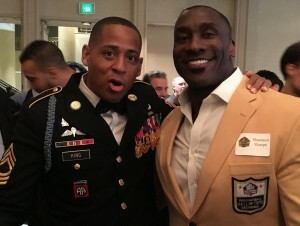 MSgt Cedric King lets nothing stand in his way! On November 2nd, 2014, Cedric set his sights on crossing the finish line at the New York City Marathon. 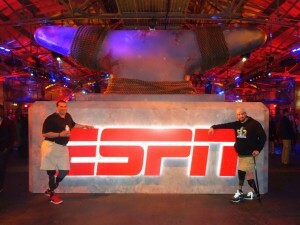 During the grueling 26 mile trek, one of Cedric’s prosthetic legs broke. He lost invaluable time as he waited to get it fixed. King knelt down and prayed. He put one foot in front of the other & never looked back. After all the crowds had gone home & clean up crews were sweeping the streets, Cedric King crossed the finish line 10 hours after starting the race. So what if he was one of the last people to cross the finish line? He did it, he displayed strength in the face of adversity, courage in the face of peril, and the willingness to stand up and fight no matter what the cost. 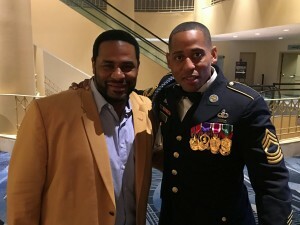 Master Sgt Cedric King recently retired from the army and moved out of Walter Reed back to North Carolina with his family. 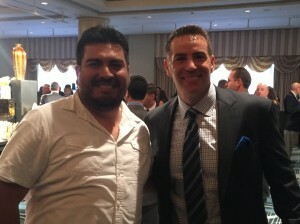 He is a public speaker, a mentor and a true inspiration. 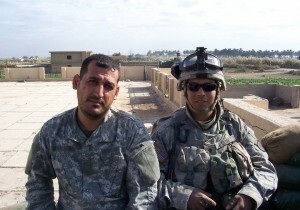 Army CPL Wesley Leon-Barrientos was deployed to Iraq in December 2007. While supporting his team on an air assault mission near Iskandariah, his team discovered and destroyed several car bombs and a weapons cache. Roadside bombs were encountered on the return trip to base and the convoy was diverted for security purposes. While maneuvering around a suspected bomb, the truck which was carrying CPL Leon-Barrientos rolled over a pressure plate IED causing an explosion to rip through the vehicle. Sitting directly behind the driver, Wesley lost his left leg and right foot in the blast and suffered severe calf injuries as well as a broken jaw. After being airlifted by a Blackhawk helicopter, CPL Leon-Barrientos fell unconscious and awoke two days later in Germany where he was stabilized for transport to Walter Reed. 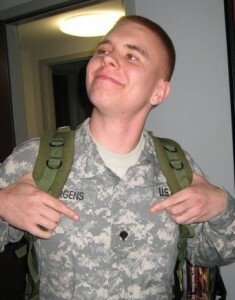 Army Sergeant Brian Jergens was on his first deployment when he lost both of his legs below the knee and sustained a severe traumatic brain injury, hearing loss, internal organ damage, a broken neck, and damage to his right elbow in an IED blast in Uruzgan Province, Afghanistan on August 7, 2011. An Army Medic, SGT Jergens was the driver of the fourth HMMWV in a convoy that day, and was thrown from the vehicle. Life-saving measures performed by his teammates prepared him for medevac to Tarin Kowt Hospital and then the Kandahar Airfield Hospital. Next transported to Bagram Air Force Base, Brian would also be treated in Landstuhl, Germany before coming stateside. Arriving at Brooke Army Medical Center in San Antonio, TX on August 14, 2012, Brian remained there until September 19, 2012. I signed up for the Marine Corps at the age of 17 out of Bakersfield California. I was inbound to boot camp on September 17, 2001. My military occupational skill was an Anti-Tank Assaultman/ Demolition Expert in the Infantry, it has forever changed my life. I ended up deploying to Iraq with 3rd Battalion 7th Marines Kilo company from Kuwait to Baghdad and ended that tour in Karbala in 2003. I deployed once more in 2004 with 3/7 Kilo Company to Al Qaim in Iraq near the Syrian Border and Euphrates River. After that I served 3 years as a field instructor at Edson Range teaching thousands of recruits on field survival. Then I went on to 3rd Battalion 5th Marines in Camp Pendleton, which I deployed to Okinawa Japan in 2009 on the 31st MEU training with military forces from, Japan, Philippines, Australia and Thailand. April of 2013 I was Medically Retired after 11 years and 7 months of active service. 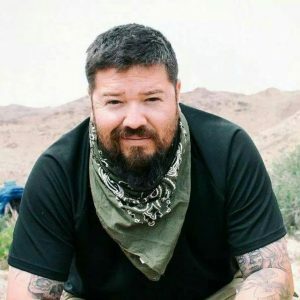 Currently, I train Service Dogs for Disabled Veterans that suffer from Post Traumatic Stress Disorder, Traumatic Brain Injury and Military Sexual Trauma at Wounded Heroes Fund, a local Non-Profit Organization in Bakersfield and I am also one of the voices of our podcast OVERWATCH. Outdoor recreation with veterans is what I truly enjoy. These activities helps me cope with the daily struggles of Combat PTSD. 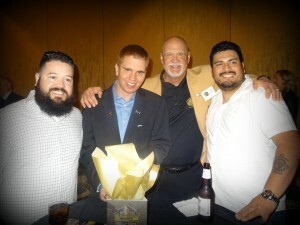 Helping veterans is my passion, if no one is willing to help, I definitely will. I am fixated on ending the social stigma of our Heroes committing suicide, 22 a day to be exact. I am the future and the voice for all my brothers and sisters. 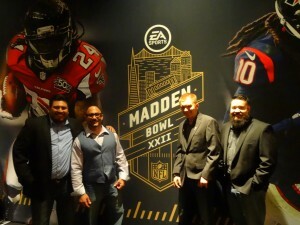 Warrior Wishes Come True at the Maddenbowl!